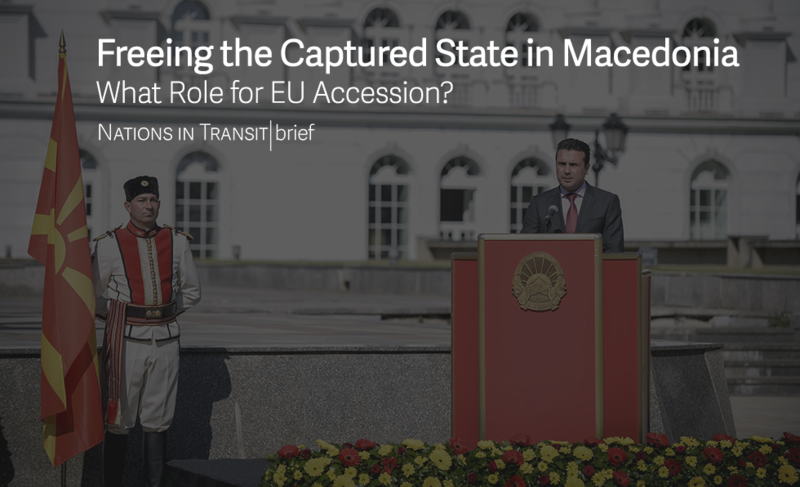 Home » Reports » Special Reports » Nations in Transit Briefs » Freeing the Captured State in Macedonia: What Role for EU Accession? Earlier this year, Macedonia experienced a turnover of power after 10 years of rule by a coalition government headed by the party VMRO-DPMNE. The turnover came after a wiretapping scandal in early 2015 had revealed large-scale, high-level corruption, massive infringements on the right to private communications, and a lack of control over the state intelligence and security agencies. Due to the revelations, in 2016 the European Commission characterized Macedonia as a captured state. The new government has committed to freeing captured institutions, regaining the trust of citizens, and bringing the country back to the Euro-Atlantic path. Using the EU perspective to put wind in its sails, it has to deal with the difficult issues of reforming the judiciary and the public administration, fighting corruption, and resolving the wiretapping scandal. It is broadly expected that the EU drive will help support democratizing forces of the society and the reestablishment of checks and balances between the various branches of government. The question remains, however, whether this is too heavy a lift for what is now a relatively weak enlargement process compared to the early 2000s. While the freeing of state institutions does require EU support, the crucial factor will be domestic consensus from all stakeholders on the direction of reforms, with a significant, but not absolute role for the executive. Empowerment beyond the executive has typically not been a strong feature of EU accession processes, but in the case of Macedonia it will be an indispensable component for success. Why is Macedonia a captured state? Over the last year, Macedonia has held two landmark elections: parliamentary elections at the end of 2016, and local elections in fall 2017. The elections came after 10 years of rule by a coalition government headed by VMRO-DPMNE, which was characterized in its latter half by widespread abuse of power. The parliamentary election on December 11, 2016 delivered 51 out of 120 mandates to the incumbent party and 49 mandates to the opposition SDSM. As the initial winner, VMRO-DPMNE tried and failed to secure a majority in the Parliament to be able to form a government. After extended political wrangling and resistance from the president of the country, the opposition SDSM was given a chance to form a coalition government and succeeded in doing so. On April 27, the parliamentary majority elected Talat Xhaferi as President of the Assembly, the first ethnic Albanian to hold this position since independence. In an effort to prevent the speaker from being elected, an informal protest movement “For a Common Macedonia,” [За заедничка Македонија] supported by VMRO - DPMNE, violently entered the Assembly and physically attacked at least four MPs from the new majority and injured more than 100 people. [i] Nonetheless, Xhaferi was elected as speaker and the new government led by SDSM was formed. The fourth turnover of power since independence was arguably the most difficult one Macedonia has seen. The change of government came after a decade of stagnation on the EU and NATO accession paths, accompanied by abuse of power by individuals and political parties. The executive branch, controlled by VMRO-DPMNE and its coalition partners, in effect dominated the legislature and judiciary, and its reach expanded into all aspects of society, including the media, academia, and, most alarmingly, the economy. A wiretapping scandal in early 2015 revealed large-scale, high-level corruption, massive infringements on the right to private communications, and a lack of control over the state intelligence and security agencies. [ii] After a lengthy political mediation supported by the EU and NATO, a Special Prosecutor's Office (SJO) was set up in September 2015 with the task to investigate and prosecute individuals implicated by the wiretapping revelations. 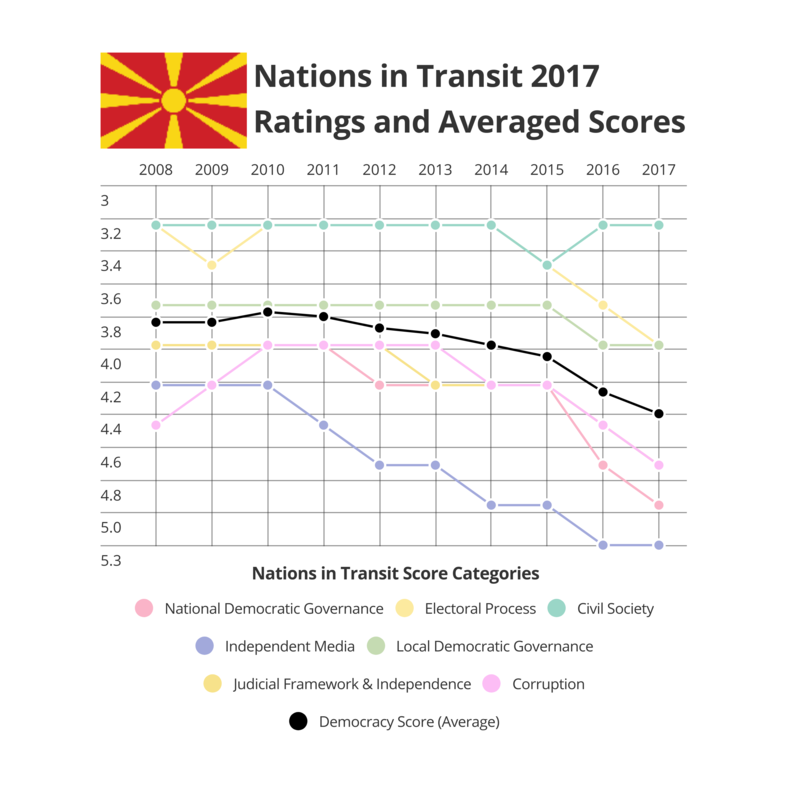 This assessment was largely reflected in Freedom House’s Nations in Transit report, where Macedonia experienced a sharp decline in all of its democracy scoring, with the exception of civil society, as is shown below. The backsliding in democracy that Macedonia has experienced over the last several years was tied to stagnation in its EU and NATO integration. EU integration has been the driving force for reforms in Macedonia since independence, including the extremely difficult reforms that followed the Ohrid Framework Agreement of 2001, which reconstructed the country’s political system to allow for power-sharing between the majority Macedonian community and the biggest non-majority community, the Albanians. The EU, along with the US, was strongly involved in incentivizing and guaranteeing these reforms, employing a combination of conflict-management measures and conditionality policy. Macedonia was once a frontrunner in the Western Balkans in both the EU and NATO processes, and still fares relatively well on alignment with EU legislation. [v] In 2008, it almost joined NATO as a well performing member, only to be blocked by neighboring Greece due to the name dispute. [vi] The same has been the case with European integration. The name dispute placed the country’s Euro-Atlantic integration in limbo and undermined the power of international actors such as the EU to support domestic change. In turn, the absence of an outside anchor helped create a fertile ground for state capture by the political parties in power. Why is there a moment now to address state capture? On the internal side, the new government has committed to freeing captured institutions, regaining the trust of citizens, and bringing the country back to the Euro-Atlantic path. Using the prospect of European integration to put wind in its sails, it has to deal with the difficult issues of reforming the judiciary and the public administration, fighting corruption, and resolving the wiretapping scandal. The public largely supports these efforts, as was clear in a September 2017 poll by the International Republican Institute (IRI), which found that 44 percent of the public considers the situation to be peaceful and stable, as opposed to 5 percent earlier this year. [viii] In the same poll, the number of people that think Macedonia is headed in the right direction has increased to 27 perrcent, from 14 percent earlier in the year. With all this in mind, there is a moment for a new start. However, the momentum needs to be used wisely, as “mistakes of the past should not be repeated and one form of state capture must not be replaced by another,”[ix] in the words of the Senior Experts Group earlier this year, and reforms should be properly planned in order to be truly sustainable. Through both its key member states and institutions, the European Union has been vocally supportive of the domestic efforts and actions to return the country to an accession trajectory. [x] Yet the question remains whether there is sufficient will and interest in the EU to assist Macedonia in a strategic manner to deal with the democratic backsliding, while capitalizing on its strengths, like its alignment with the EU acquis and standards. Is the EU accession process fit for “freeing” state institutions? Since the new government came to power, there have been various efforts at designing judicial and state administration reforms. While their realization does depend on support from the EU, the crucial factor is the domestic consensus of all stakeholders on the direction of the reforms. The experience so far has been that the executive has taken the lead in the reforms both to the judiciary and the public administration, as well as media and security services. In these circumstances, it is of utmost importance to engage with the judiciary and parliament due to the reasons mentioned above. The executive-led reforms have the potential of being quicker, but they are also more prone to subversion, as we have seen in the past. In order to avoid this risk, the judiciary and the legislative will need to build up their capacity to be on equal footing with the executive, which will necessitate more time for building consensus. Empowerment beyond the executive has not been a strong feature of EU accession processes, but in the case of Macedonia it will be an indispensable step for success. In this respect, one must keep in mind that in the area of judiciary the European Union does not have uniform rules, making it all the more difficult to support and streamline reforms. In Macedonia, the EU has worked even harder than usual to provide a map for reforms, as demonstrated by the deployment of a senior expert group to assess the state of play in the political criteria, with a focus on the judiciary, public administration and independent oversight. [xv] Still, most of the recommendations are based on the notion of EU best practices in the rule of law, which can always be subject to broad interpretation, i.e. politicization. In these circumstances, more deliberation and the inclusion of all actors are even more needed. In light of the reasons above, in order to create an environment conducive to freeing the captured state in Macedonia it is necessary to rethink the standard approach to enlargement from several perspectives. Second, the previous factor impacts substantially the time needed to devise policy approaches that would free Macedonia’s institutions. Unfortunately, building consensus takes time that is not readily available when rushing on the EU accession path. Policy and decision-makers have at times argued that time is an inhibiting factor at the national level. In these circumstances, in Macedonia two opposing logics are competing at the moment: on the one hand, the need to free state institutions, which is by definition a lengthy process, and on the other hand, the need to devise reforms with a relatively quick result. While there is an urgent need to make up for lost time,[xviii] there is still a risk of rushing to solutions. Hence, at times it will be necessary to prioritize the quality of the process and solutions it produces over the speed of adoption. Third, on a broader scale, both of the previous recommendations have a bearing on the approach of the EU in terms of its engagement with stakeholders in Macedonia. While the expectations for implementing reforms do fall on the executive, the EU and its representatives need to engage more actively with the other groups mentioned above in order to set an example for the executive as well. These include the actual use of the numerous bodies engaged in the EU accession process, including but not limited to the National European Integration Council, the parliamentary body with the broadest composition of stakeholders that is traditionally chaired by the opposition parties. At the end of the day, through their public meetings, the EU representatives act as legitimizing actors in the national and EU arenas as well. Lastly, going back to the basics, if the EU is to have a lock-in effect in a case where an authoritarian government exited power through elections, engagement needs to be combined with a credible accession perspective. The standard way of doing this would be through opening the EU accession negotiations, as they have shown to be the game-changer in terms of institutional and elite engagement. In the Macedonian case, the situation is complicated by the name issue. The EU needs to help provide a fertile environment and support to the solution of the name issue, or to engage on the name issue with interest comparable to the accession negotiations with the Macedonian institutions. The latter would necessitate a mobilization on enlargement that we have not seen in the EU for a long time. The EU has announced the adoption of a new strategy on enlargement early in 2018, mostly with reference to Serbia and Montenegro. Given the historic opening in Macedonia, one way to use the current opportunity would be to include Macedonia in this document. Even if it unable to do so at this time, EU institutions need to keep in mind that the current opening in Macedonia is a “make it or break it” opportunity and engage with the appropriate urgency. The new government in Macedonia has committed to freeing state institutions by reforming the judiciary and public administration and fighting corruption, using the process of EU and NATO accession as external anchors. This will not be an easy task by any standards: a turnover of power does not by default result in overcoming state capture. (Re)instating checks and balances in the system is a long-term endeavor, which will at times require running against the executive-centered reform logic that is the usual mode of EU accession. Nonetheless, the empowerment of all branches of power is certainly a necessary, if not sufficient, component of freeing the Macedonian state. [iii] According to Transparency International, state capture is a situation where powerful individuals, institutions, companies or groups within or outside a country use corruption to shape a nation's policies, legal environment and economy to benefit their own private interests”. [xii] PRIDHAM, G., Designing democracy: EU enlargement and regime change in post-communist Europe, London, New York, Palgrave Macmillan, 2005. [xiii] PRIDHAM, G., European Union Accession Dynamics and Democratization in Central and Eastern Europe: Past and Future Perspectives1. Government and Opposition, 41, 373-400, 2006. [xiv] GRABBE, H., The EU’s transformative power: Europeanization through conditionality in Central and Eastern Europe, London, New York, Palgrave Macmillan, 2006.